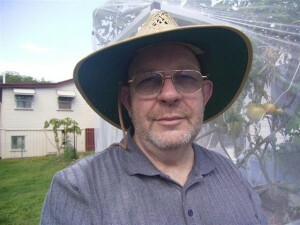 Hi……I’m Gary Donaldson….and I’m an urban farmer. My commitment to backyard food production spans over 30 years. I commenced my apprenticeship in urban farming in the mid 1970’s and the craftspeople who contributed to my induction into backyard food production included people like the New Alchemists, John Seymour, Michael Allaby, the members of the Farallones Institute and others. My partner Jan and I were pioneers of the South Australian game bird industry and we’ve bred and reared chickens, ducks, rabbits, worms, pigs…….you name it. If you’re interested, you can read more of the biographical stuff………here. In 2007, I published The Urban Aquaponics Manual and in 2008 we launched the second edition of this most up-to-date publication of its type in the World. I own and operate Aquaponics HQ….a well-moderated discussion forum on aquaponics and other food production-related matters. This site exists to inform and educate its users about Microponics – the Integration of Fish, Plants and Micro-livestock…….and its ability to put clean, fresh food on the table. In some circles, I’m regarded as the enfant terrible of aquaponics …..largely because I have the unfortunate habit of challenging the “mythconceptions” that surround backyard food production……and that brings me to the secondary purpose of this site. Here I get to conduct robust commentary and debate about various aspects of integrated backyard food production without having to tippy-toe through the ‘feelings’ or vested interests minefields that are a feature of most forums. With that in mind, I invite you to journey with me. First and foremost thankyou for sharing your extensive experience with the wider community – it’s people like you than inspire others (myself included) to embark on the “kitchen garden” and all the various forms that it takes. I’ve recently bought a house with a modest yard which I plan to turn into a sustainable food source for my girlfriend and I. I am particularly intreested in breeding crayfish as I dont think i’m ready to try fish just yet (although i’ve successfully kept aquariums for some years, there’s still a lot I need to learn). I’m wondering if you’ve tried farming crayfish as I dont recall seeing anything apart from a brief mention on your website. I’m still in the information gathering phase but would like to hear from someone who’s had experience in that area. Brent…..I haven’t had a great deal of success with breeding crayfish yet. I’ve had a couple of attempts but a combination of water monitors and overfeeding put paid to both lots. I actually find growing fish much less difficult…..but I like redclaw so I’m going to try a bit harder to raise some in the future.